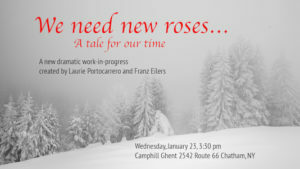 The locally based actors Laurie Portocarrero and Franz Eilers will present their original dramatic work-in-progress, “We Need New Roses . . .” on Wednesday, January 23 at 3:30 p.m, in the Culture Hall at Camphill Ghent. This is a fairy tale for grown-ups depicting the journey of the modern human soul to melt the ice threatening to hold it fast. Camphill Ghent is an inclusive eldercare community located at 2542 Route 66 in Chatham, NY. The Culture Hall is located in the blue building at the top of the hill.